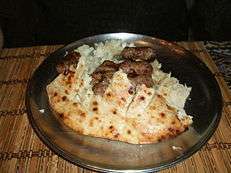 Bosnian cuisine is balanced between Western and Eastern influences. The food is closely related to former Yugoslav, Middle Eastern, and other Balkan cuisines. Bosnian cuisine uses many spices, but usually in moderate quantities. Most dishes are light, as they are cooked in lots of water; the sauces are fully natural, consisting of little more than the natural juices of the vegetables in the dish. Typical ingredients include tomatoes, potatoes, onions, garlic, bell peppers, cucumbers, carrots, cabbage, mushrooms, spinach, courgette, dried and fresh beans, plums, milk, paprika and cream called pavlaka and kajmak. 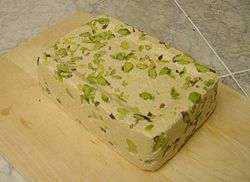 Typical meat dishes include primarily beef and lamb. Some local specialties are ćevapi, burek, dolma, sarma, pilav (pilaf), gulaš (goulash), ajvar and a whole range of Eastern sweets. The best local wines come from Herzegovina where the climate is suitable for growing grapes. Plum or apple rakija, is produced in Bosnia. Begova Čorba and lepinja bread. Burek – a meat-filled flaky pastry, traditionally rolled in a spiral and cut into sections for serving. The same dish filled with cottage cheese is called sirnica, one with spinach and cheese zeljanica, and one with potatoes krompiruša. All these varieties are generically referred to as pita (Bosnian for "pie"). Somun  and Ramadan somun (with Ćurokot seeds). Wines are produced mainly in Herzegovina, in the regions of Mostar, Čitluk, Ljubuški, Stolac, Domanovići, and Međugorje. Local spirits are distilled from plums, pears, or grapes, with alcohol content of 45% and higher. ↑ "Sarajevski somuni: Miris mahale, tradicije i savršenstva". klix.ba. 3 September 2015. ↑ "Ramazanski somun". moje-zdravlje.ba. 3 September 2015. Darra Goldstein; Kathrin Merkle (eds.). Culinary cultures of Europe: identity, diversity and dialogue. Council of Europe. pp. 87–94. ISBN 92-871-5744-8.